Your tuition fees are invested to provide you with a transformational education. They help us to create the stimulating and cutting-edge environment that supports the world-class research and education we offer at Essex. We are ranked 4th in the country for facilities spend per student in The Times and Sunday Times Good University Guide 2018. 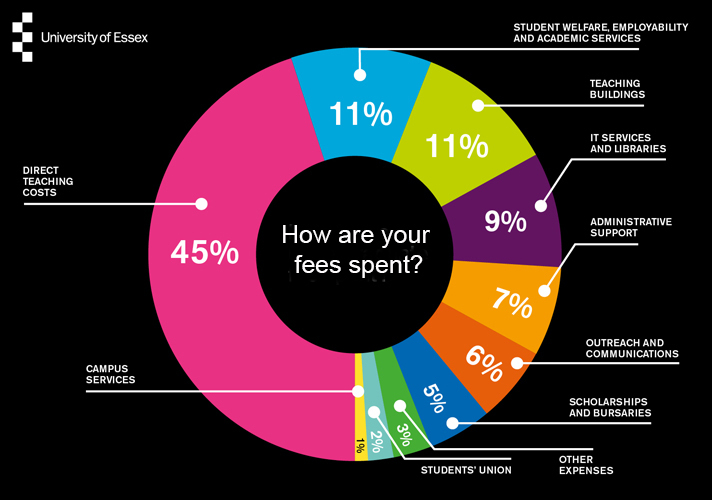 Your fees contribute to the teaching costs of seminars and lectures, and all aspects of your student experience, from our wide range of sporting activities to our employability services and our leading Students' Union. Essex is top 15 for the sixth year running in the NSS (2018, overall student satisfaction, English mainstream universities*), showing that our students are happy with the value they get at Essex both in terms of their education and experience. We're in the top 20 universities for research excellence and top 5 for social sciences (REF 2014). We have ambitious plans to keep climbing up league table rankings so that your Essex degree is even more valuable in the graduate job market. To support your future career, we have embedded research and workplace skills in your Essex education. We also offer language tuition at no extra cost, and a Big Essex Employability Award, which takes account of your work experience, volunteering and student society participation. Fees for Home and EU students are set by the UK Government. In previous years, the tuition fee has increased for each academic year of study. The 2018 fee was frozen but we do not know yet if, or when, this will change. Previous increases were limited to the annual increase in the RPI-X index. The fee status of EU students may be subject to review should the terms of the UK's withdrawal from the European Union change the legal status of EU students, but we will do all we can to mitigate this. Universities still get some government funding for UK and EU students but none for international students from outside the EU. International student fees are therefore higher to reflect the full cost of your education. We also provide extra regulatory and support services for international students (for example, help with immigration and English language support), and these costs are reflected in the fees we charge. Essex is a statutory charity so we don't have shareholders asking us to make a profit. We do aim to generate a small cash surplus each year that we can directly reinvest in the University, to continue to improve your experience through new buildings, IT equipment, and better services.